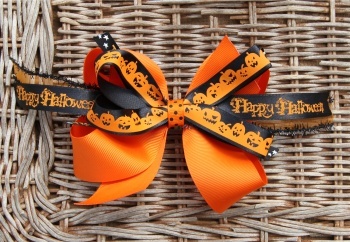 This is a triple layer of Halloween bows that will look great with that Halloween outfit. The bottom layer is an orange 1.5" grosgrain ribbon, covered with a layer of 3/8" orange and black polka dot grosgrain ribbon in a "X" formation. Through the center is a layer of "HAPPY HALLOWEEN" satin ribbon that is on top of a sheer orange satin with black fringe edge ribbon. The top layer is a black satin ribbon with orange pumpkins that have smiling and ghoolish faces. All wrapped together in a French knot by the orange and black polka dots ribbon. 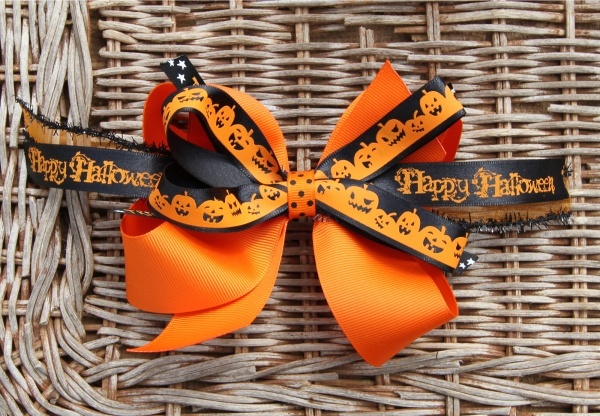 Happy Halloween with this bow!